A few days ago we released a major update for our very popular MH Magazine WordPress Theme. The new version of MH Magazine has been heavily recoded to make the theme ready for further development and modern web technology. Among several new features, options and custom widgets, we've also recoded large parts of the overall codebase to further improve performance and ensure maximum compatibility with 3rd party scripts and plugins. For the new version of MH Magazine WordPress Theme we've created a video that shows some aspects of what is possible with this modern and flexible magazine theme for WordPress. The theme has a fully widgetized Homepage template included where you can place widgets as you like to create endless layout variations and use the theme for modern online magazines, dynamic news websites and professional blogs of any content genre. In addition to the new commercial, we're also working on a new tutorial video for MH Magazine WordPress Theme to show the necessary steps regarding installation and configuration of this flexible magazine theme for WordPress. The tutorial video will especially be helpful for WordPress newbies who are not yet really familiar with how WordPress works. As soon as the new tutorial video for MH Magazine is available, it will be added to the theme documentation for MH Magazine to complement the resources that are already available there. Of course the development of new awesome stuff for our popular magazine theme will continue as usual. At the moment we're already in the process of planning the next updates and we're constantly working on making the MH Magazine WordPress Theme better and most flexible, without losing focus for usability and ease of use. 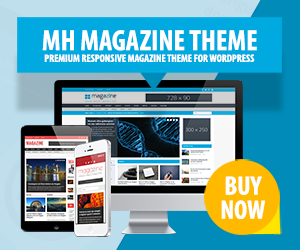 We're very grateful that you like this theme so much and with your support and loyalty over the years, the MH Magazine theme has already become one of the most popular magazine themes for WordPress. We're working hard to keep this high level and we'll keep providing you with the tools you need to create awesome and successful online magazines and dynamic news websites.